Travel from Seville to Faro. Compare and combine trains, buses and carpooling in one search. Find the cheapest tickets. What is the best way to get from Seville to Faro? The most popular way to get from Seville to Faro is by bus, since there are not any direct trains. The ride can take from 2h 15min to more than 4h, depending on the quantity of intermediate stops. Prices usually stay between 25-30€, but it is possible to find tickets for 20€. Alternatively, car-pooling is widely used in Spain, so it might be possible that somebody planning to drive from Sevilla to Faro offers the seats that are still available. In that case, this is usually cheaper than bus. In order to see all updated times and prices for a specific date, try Travelinho's search engine. Is there any train from Seville to Faro, Portugal? There are no trains operating between Seville and Faro, neither direct nor with changes; unless one makes a huge detour of more than 600km. The borders of Spain and Portugal are not connected by rail tracks in the south. Railway tracks cross the border between Spain and Portugal in three different places, but not in the very south. The only option currently possible to travel from Seville to Faro by train would be getting first from Seville to Lisbon and afterwards taking a train from Lisbon to Faro with Comboios de Portugal. However, this would take not less than 19 hours and it would cost more than 90€! I really want to go by train. No bus, no car, but train from Seville to Faro. How can I do it? In case you do not want to consider any other mode of transportation apart from trains, you will need to make a big detour. Travel search engines have difficulties providing results in such cases, so you will need to split the journey in different segments. First you need to get from Seville to Lisbon. 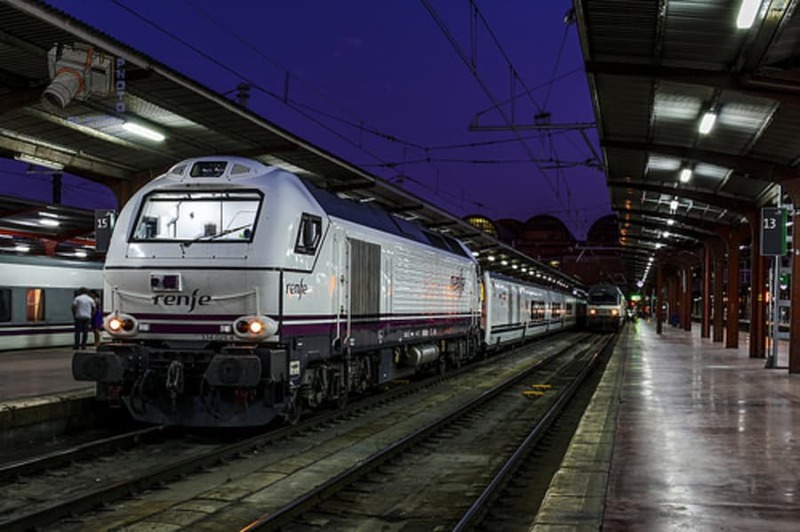 Take an AVE train from Seville to Madrid. Take the night train from Madrid to Lisbon. Night train Lusitania at Madrid Chamartín Station before departure to Lisbon. This second alternative is shown by some search engines, but you need to spend a night in Badajoz. In addition, it takes more time and more changes than with the option via Madrid. The journey crosses the border between Spain and Portugal with a regional train from Badajoz to Entroncamento. This train runs only once every day. Regional train from Seville to Merida. Note: train does not run every day of the week. Interegional train from Merida to Badajoz. 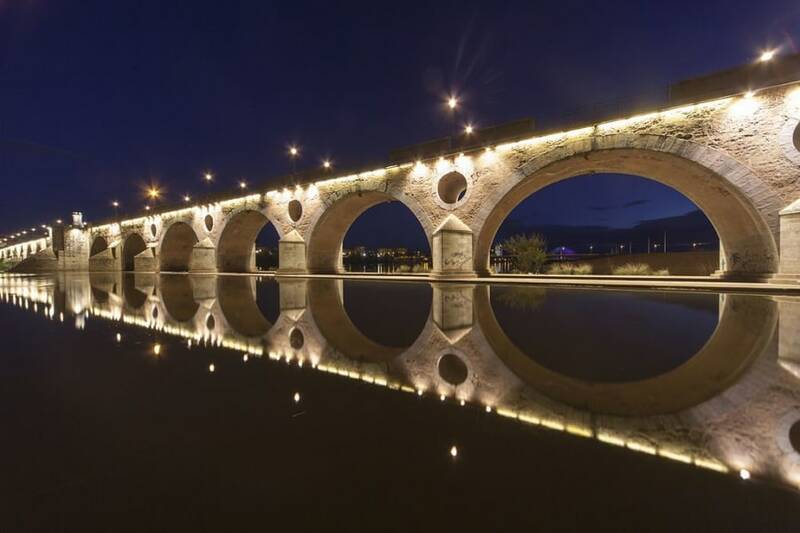 Guadiana river and Puente de Palmas bridge at night, Badajoz. Wondering what to do in Badajoz? Check out things not to miss in Badajoz explained by local Piggy Traveller. Regional train from Badajoz to Entroncamento, Portugal. Regional train from Entroncamento to Lisbon. As a last step, take a train from Lisbon to Faro with Comboios de Portugal. Times are only for reference and might not be up-to-date. How to get from Seville to Faro by bus? There are several companies that offer this route, including Alsa, Eurolines, Damas and Flixbus. The duration varies depending on the company and the stops done along the route. The fastest buses take 2h 15min, while the slowest take about 4 hours. Expect to pay between 20 and 30€ for a one-way ticket. However, prices are not fix, meaning the sooner you book, the cheaper the ticket. Alsa buses usually depart in Seville from Santa Justa station, stopping half an hour later at Plaza de Armas. You can buy the ticket from the station that is more convenient for you. In Faro, the bus stops also in two different stations: Faro Airport (FAO) and the main bus station in the city, Faro Rodoviario. Although the frequency of the buses can vary depending on the day and the season, as average 4 buses run daily between Seville and Faro. Times are local times. Time-zone change between Spain and Portugal is -1h. Damas runs at least two buses every day. Departure in Seville is at Plaza de Armas. In Faro, buses normally stop first at the main bus station, Faro Rodoviario, and at Faro Airport. Eurolines runs at least one bus every day. Departure in Seville is also from Prado San Sebastián and from Plaza de Armas. In Faro, similarly to Alsa, buses normally at Faro Airport (FAO) and the main bus station in the city, Faro Rodoviario. Make a search with Travelinho to get all prices and times for a specific date. 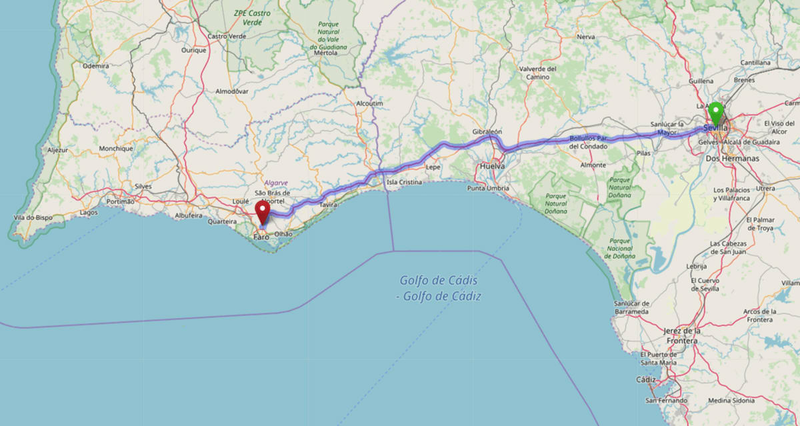 How can I get from Seville to Faro by car? A distance of 199 km separates Seville from Faro. This can be covered by car in 2h 15m with normal traffic conditions. Car-pooling is very popular in Spain, being the biggest platform BlaBlaCar. A ride from Seville to Faro usually costs between 10 and 17€ and takes 2h 30min. Most of the offers are available only a few days before departure. In this case, there are usually several alternatives per day. However, if you plan your trip with more time, you might not find any option yet. Driving your own car will cost 22€, according to Via Michelin. The cost includes 18€ for fuel consumption and 4€ for tolls. If you don't own a car and you need to rent one, you will have to add also that cost. Make sure to check with the rental company if you can cross the border to Portugal. Alternatively, you can also rent a car from a private owner who is not planning to use it. The platform Amovens makes these sort of exchanges possible. What can I visit on my way from Seville to Faro? If you want to plan the journey with any stop along the way, there are a couple of places definitely worth visiting. An ancient Roman city. Its ruins have been used as scenario to recreate 'The Dragonpit' in the popular TV-series Game of Thrones. Replicas of the three ships were used by Christopher Colombus when he discovered America in 1492. If money is not an issue, there is also the possibility to book a private car transfer. This option is very flexible regarding times and as hassle-free as you can get. The company daytrip seems to have a high quality service according to reviews on Tripadvisor (we have not tried them ourselves). They also offer the possibility to visit different sights along the way. There are no direct flights from Seville to Faro, although both cities have an airport. The best flight connection will be probably via Lisbon. 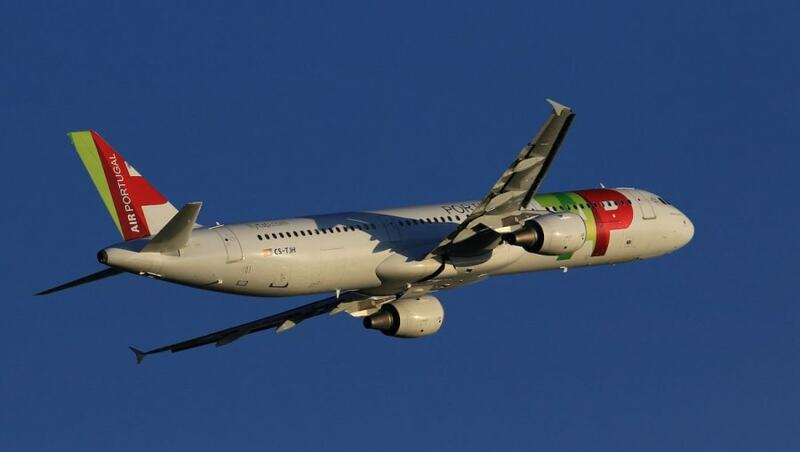 TAP Portugal offers a possibility with quick transfer and a total travel time of 3h. However, prices below 100€ can only be found when booking with some months in advance. 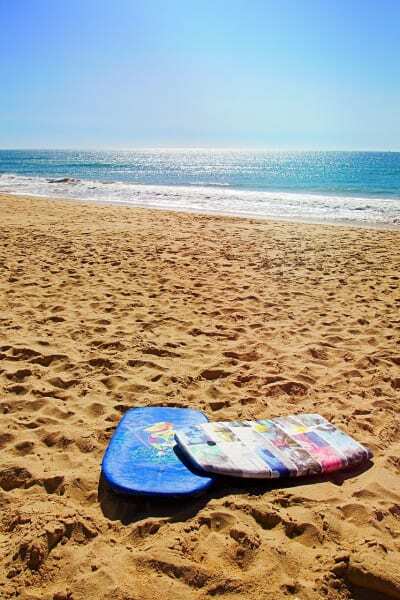 If you are travelling to Faro, you might be interested in looking for accommodation. By using the search box below you can find the best prices in several types of accommodation, from low-budget hostels, to appartments and fancy hotels. The sooner you book, the cheaper it will be. In some cases you might have free cancellation under certain conditions! Faro beach. Photo by Jonny_Joka on Pixabay. 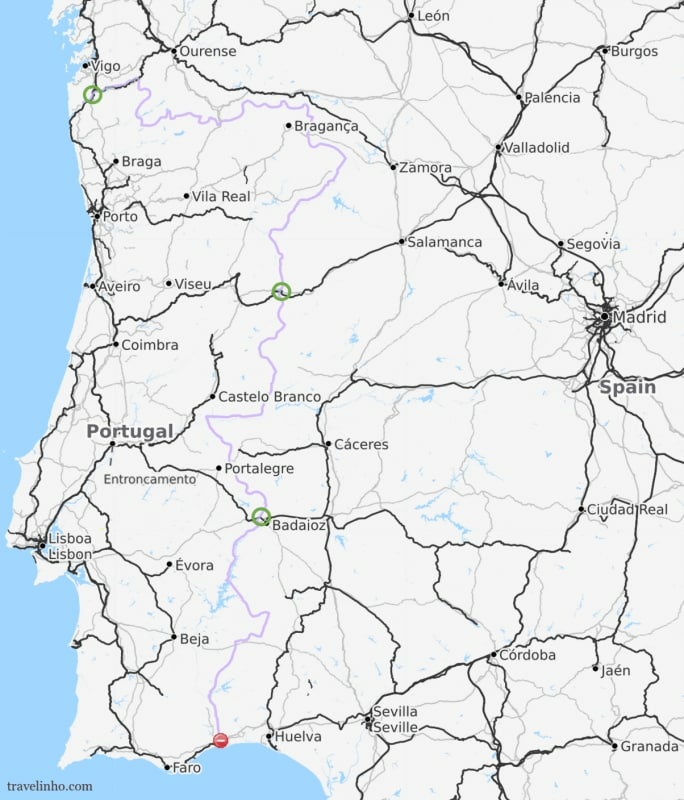 Map showing the railway tracks crossing the border between Spain and Portugal. Source: © OpenStreetMap. Trenhotel Lusitania. Photo by Aleix Cortés on Flickr. Badajoz. Photo by Philips Communications on Flickr. Road map from Seville to Faro. Source: © OpenStreetMap. 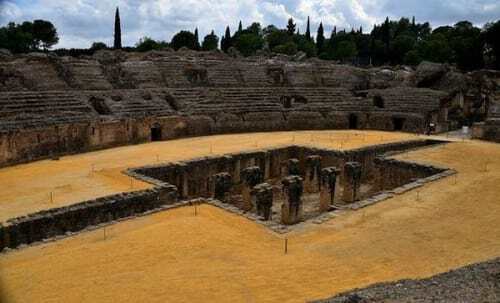 Italica. Photo by Tony Fernandez on Flickr. 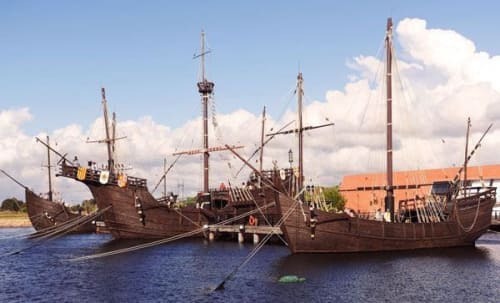 Pinta, Niña & Santa María ships. Photo by Darla Hueske on Flickr. TAP airplane. Photo by Victor on Flickr.